fantasy art and tree chatter of aquariann: Branch out to Gingerly Spice! Branch out to Gingerly Spice! Does anyone else embrace the tradition to add a handmade Christmas ornament to their collection each year? 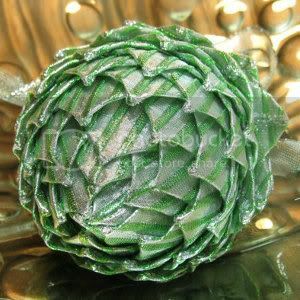 Ruth and Deborah Nash, the mother and daughter team at Gingerly Spice have gently folded dozens of ribbon pine cone ornaments (like the silver and green striped one to the right) in a range of colors and glittery goodness to match any Christmas tree. Their holiday decorations would also make unique hostess gifts, especially to embellish a table centerpiece or tie as a bow on a present. The designing duo has always loved creating beautiful works of art and crafts to decorate their home and surroundings. 40 years of sewing experience and a lot of heart helps to make creations that enhance and enrich any decor with a touch of class. They purchase quality supplies from local craft and fabric stores and strive to make each work one of a kind, so no two items are exactly alike. Ruth and Deborah would like their customers to know that "We put it all together with love and care, trusting that you will find as much joy displaying them as we have in creating them." Become a blog sponsor like Gingerly Spice! So beautiful! It looks like so much work went into making it!